Canada 2007, They closed the road. Park Ranger drove me back to Jasper, they closed the road. Here I am on top of Icefield Parkway. I met some people from Edmonton and they invited me to stay at their hotel and go to a New Year's party. One of them is of a family from Norway and we had a lot to talk about. It was very enjoyable to stay with them and we had a big New Year's party which lasted all night. 35km, -2 C. Snow and bad winds all day, which is really what I can without after 2 days of heavy New Year partying. Stayed at Athabasca Fall Hostel, where they give me dinner and were nice company. 50km, -3 C. Snow and bad wind today again. A park ranger stopped me and said the road is closed (too much snow)....and I have to return to Jasper which I didn't want so I tried continuing. But that didn't work so they gave me a lift back to Athabasca Fall Hostel. They said when the road opens again they will take me back to the same place where they picked me up, so that I may continue from where I left off. The hostel has kindly offered a free place to stay for as long as the road is closed. Road open 12 pm today which will be too late to start biking. 50km, -15 C. Bike 7 H. experienced all kinds of weather today. Winds from the back, side and particularly strong headwinds which made me having to walk quite a bit, even down hill. Climbed much and used lot of power today. But I love it. They closed the road again in the evning. Saturday 6/1 Rampart- Icefield parkway. 40km, -3C, Bike 7 H. They opened the road at 11am and then I started to bike. Was so tired after yesterday and felt like hell trying to bike today. I had to walk a lot and it was dark when I finished. I was lucky to get invited to a very nice lodge, http://www.num-ti-jah.com/ and I am able to stay for 2 days free as long as I talk about my trip to the guests and owner. Really nice place in the Rocky Mountains, old cabin style and very nice people. 50km, -2 C. Nice weather. 130km, -10 C. Invited to stay in a house. 100km, -7 C. Bad wind. Police stopped me for bad lights, they wouldn't let me bike any more this night and drove me 20 km in to the city. I think it will take a long time to cross Canada, I've met so many nice people and they are always inviting me to stay in their homes. 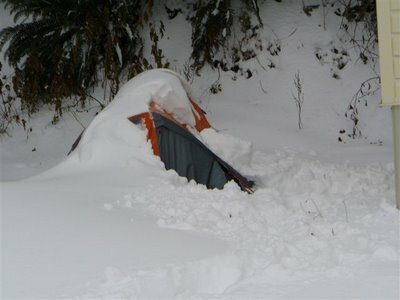 I've been in Canada 30 days and have only slept in my tent 5 nights. Christmas without my family is a little sad, I miss my family a lot right now. I am now in a National Park and it is so nice here, I love biking in nice nature. Biking distance from 12/12 to 12/19. 70km, 2 Celsius. Nice weather, sun. Sleep in house. 60km, bike 3 H, good wind and mostly sun. Slept in house. Relaxed today, rode a snow mobile and was invited to a christmas party. 50km, bike 5 H, 2 Celsius, very bad wind today. 50km, bike 2.5 H, 2 Celsius. Nice day. Wedensday 20/12 to Monday 25/12. Prince George. Stay here for few days and was invited to cristmas party, meet a lot of nice people. But cristmas without family is little sad. I am lucky, many people have invited me to stay in their homes. People are very nice here. Two police cars have stopped me on the road. It was the first time on my trip that they checked my passport, I belive they think I have run away from a mental hospital or something. But they are friendly and asked all about my trip. Many truck drivers said they can't see me when it is dark, can't understand that. I look like a Christmas tree! It is not too cold yet, but people keep telling me that it will be soon. 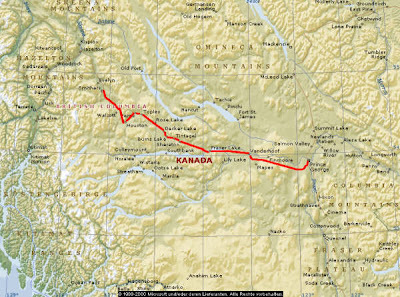 Plan for biking Canada in winter. 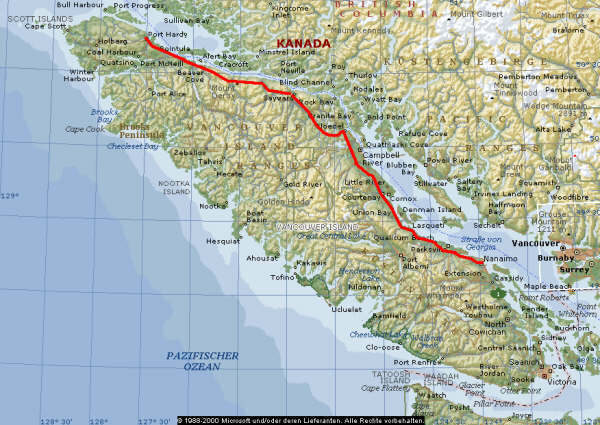 Plan for biking Canada in winter 2006/2007. 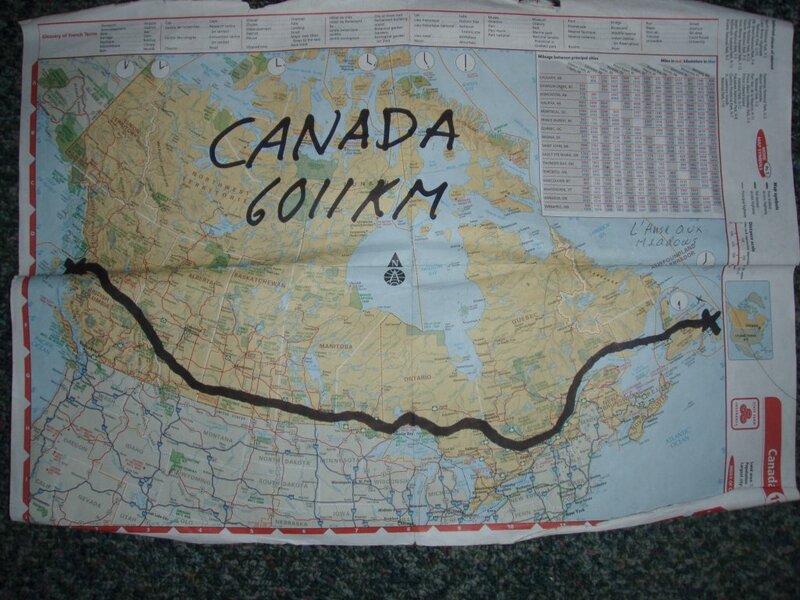 Estimated at 6088 km/3783 miles. Waiting for my ferry in Port Hardy. My ferry leaves to Prince Rupert. Arrive in Prince Rupert. Stayed one night here free in hostel. 40 km, 0 celsius. Rain all day, slept in tent. Bad wind, bad rain and bad day. Met a church pastor, I stayed for 3 days. 96 km, -2 celsius, little rain. Stayed in a house. There has been a lot of bad weather and my legs aren't quite as strong as they have been. Sometimes when I'm biking it is dark, snowing and cold. Many cars have stopped and offered me a lift but I've said no thanks to all, but many of them think I am crazy. One day, 15 cars stopped and asked if I was OK? I said I was fine, but not everyone seemed to believe me. Someone called the police to who I said again that everything was OK.
One truck driver stopped and didn't believe that I was fine and he gave me a paper titled "My Struggle with Suicide"! I met a Pastor in Terrace and stayed at his place for 3 days. He gave me many names and addresses of people I could stay with in Canada. He fixed a new jacket for me too, as my old one was not waterproof anymore. The friendly people of Patagonia sent me a new jacket. I am definitely learning the hard way as I have never biked in the winter before. I saw a wolf for the first time in my life, it was so BIG! People who have helped me on the road, please click on this link. I woke up in the morning like this in Port Hardy. So far, I've biked this distance in November. 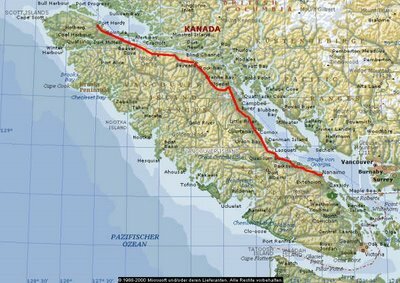 My goal is to to bike Canada from West (Prince Rupert) to East (New Foundland) in the winter time and mostly on Highways 16 and 1. 100km/65miles, good wind, little rain. 30km/18miles. Rain all day, slept in my tent behind a pub. 45km/27miles. Rain all day, slept in tent. 35km/21miles. Rain all day, slept in tent, everything is wet. Police stopped me, no light and helmet. Only a warning, no ticket. Whew! 64km/38miles. Rain/snow all day. Met a kind lady and will stay with her and get my things dried. Sayward. Will relax here for a few days. My ferry will not go before wednesday. Cool hippie place with a nice live band which plays every Friday. Enjoying my time here. Snowed all day. Sleep behind a pub in my tent. Mostly windy and many small hills to climb. Invited to sleep in house. Nice weather all day, but starting to get cold. Waiting for my ferry now. One of the ferries had sunk, so now there is only one ferry. They said that it is scheduled for today but the weather is too bad. I now have to wait until Saturday. I have been invited by a fisherman to stay at his house.